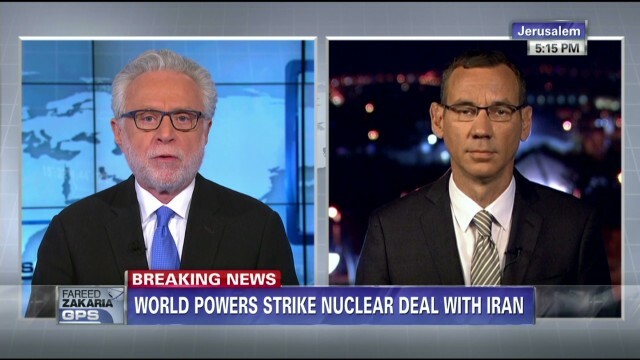 CNN’s FAREED ZAKARIA GPS features an interview with the spokesman for the Israeli Prime Minister Benjamin Netanyahu, Mark Regev, who spoke to Wolf Blitzer about the historic deal between Iran and the P+5 nations that negotiated temporary sanctions relief in order to slow Tehran’s nuclear program. A transcript is available after the jump. WOLF BLITZER, HOST: Welcome back to GPS. I’m Wolf Blitzer in Washington. We’re following breaking news, an historic deal between Iran and the international community over its nuclear program. One of the fiercest critics of the deal, one of United States’ most important allies, Israel. Joining us now, the spokesman for the Israeli prime minister, Benjamin Netanyahu, Mark Regev, joining us from Jerusalem. Mark, thanks very much for coming in. What’s wrong with giving diplomacy a chance to deal with Iran’s nuclear program over the next six months? Isn’t diplomacy a better option than the military option? MARK REGEV, ISRAELI PRIME MINISTER’S SPOKESMAN: Of course, we want to see diplomacy succeed. Of course, we’d like to see a peaceful solution. Israel, more than any other country, has an interest in a successful diplomatic outcome. Ultimately, we’re the first people on the firing line. But we want to see a genuine deal, a good deal, a deal that has ability to sustain itself, that actually does dismantle the Iranian military nuclear program. And we’re concerned that this deal that came out of Geneva is a bad deal and does not actually attain that goal. I mean, ultimately, we want to see the Iranian nuclear military program dismantled. That’s the goal. And, we’re, frankly, not sure that this deal accomplishes that. BLITZER: Well, here’s the president speaking last night, late last night, from the White House. BARACK OBAMA, PRESIDENT OF THE UNITED STATES: The resolve of the United States will remain firm, as will our commitments to our friends and allies, particularly Israel and our Gulf partners, who have good reason to be skeptical about Iran’s intentions. Ultimately, only diplomacy can bring about a durable solution to the challenge posed by Iran’s nuclear program. BLITZER: And Secretary Kerry told our own Candy Crowley that Israel will be safer as a result of this interim deal right now. I want you to respond to what the president and the secretary of State have been saying. REGEV: Look, we all share the same goals. Israel and the United States agree that the Iranians cannot be allowed to achieve — to build nuclear weapons. Now, on the tactics of how to achieve that, we can have honest differences. And we are concerned that a deal in which you give the Iranians, up front, sanctions relief — and they are getting relief that amounts to in the billions. We’re afraid that you’re removing from the table an important leverage on the Iranian regime. I was following the wires, Wolf. I saw the Iranian currency has already bounced up. I see that there are already — the Iranian economy, you’re already seeing signs just from last night’s decisions. Now, if pressure on Iran is reduced, if the sanctions are going to be eased, then what motivation do the ayatollahs in Tehran have for actually coming forward and doing the serious heavy lifting on the really important issues, that is, actually dismantling their military nuclear infrastructure? This deal does not do that. They don’t have to dismantle a single centrifuge. They don’t have to dismantle that plutonium producing heavy water reactor. That is further down the line. And if you’re now reducing the pressure, what motivation do they have to make those difficult decisions? BLITZER: The motivation they have, if you believe the president of the United States and the secretary of State and the other members of the U.N. Security Council and Germany, is those sanctions that are being eased right now, they can be reinstated overnight. The architecture, they keep saying, is in place. If the Iranians cheat, they will pay a price, because all of those tough sanctions and additional sanctions could be imposed, making life even more miserable for the Iranians. And the new president, Rouhani, presumably doesn’t want that. That’s the pressure that they have over these six months. REGEV: As the president said, we’re skeptical and are our Arab neighbors. We all believe that it is crucial to keep pressure up on Iran. It’s crucial that the Iranians only get sanctions relief, in our opinion, if they actually take tangible steps. And what they’ve done is they’ve taken cosmetic steps. They’ve taken steps that are not really significant steps, that they can reverse within weeks. And we’re also concerned, in Israel, with the other side of the equation, not just that the Iranians haven’t taken serious steps, but that the West, that the international community is actually lifting sanctions in a way that can start a process which is not reversible. It’s like having that small hole in your tire. A small hole in the sanctions regime, in the end, like with your tire, you’ll get a flat. We’re concerned. We believe the pressure should be maintained on the Iranians until there is a dismantling of their military nuclear infrastructure. BLITZER: Can we assume, Mark, that the Israeli military option to launch an air strike, if you will, against Iran’s nuclear facilities, is off the table, at least during this six month interim agreement? REGEV: Look, Israel will always reserve the right to defend itself, to protect our people. And this regime in Tehran, just last week, the supreme leader, the aptly called supreme leader, Ayatollah Khamenei, he called Israelis “rabid dogs” and he spoke about Israel disappearing. This is the regime that consistently has talked about wiping my country off the map. This is a regime that has consistently called Israel a cancer that has to be removed. We would be irresponsible not to take those threats seriously. And my prime minister would be irresponsible in not taking the necessary steps to protect the people of Israel. BLITZER: So the answer is the option remains on the table, a military strike between now and the next six months? REGEV: We, of course, would like to see a diplomatic solution. We’d like to see a peaceful dismantling of the Iranian military nuclear program. If that can be achieved, that’s obviously preferable. But Israel always reserves the right, as President Obama has said, the right to defend ourselves by ourselves against possible threats. BLITZER: Mark Regev is the spokesman for the prime minister of Israel, Benjamin Netanyahu. Thanks for having me, Wolf. BLITZER: We’re going to have much more on this historic deal. Just ahead, a panel of experts standing by to weigh in.